We're so grateful to have such wonderful people who some how find us and through the magic of fitness become good friends. Just finished the 8 week Fit Dad program, what can I say, I was certainly put thru many physical and mental challenges but have come out on the other side and pretty proud of my efforts, I hadn’t really thought too much about food in the past and just ate what I wanted and whenever I liked. I am now conscious of the positive impact healthy eating has on my life and the benefits are outstanding. I’m 37 years old and I feel I am in the best shape I have ever been in with plenty of energy to burn. Alcohol was also a huge part of my life and I barely went a day without having a beer (or many), wine or spirit, I have now managed to limit myself to the occasional social beers with mates and feel better for it. My wife was also very supportive of my new lifestyle changes which has helped immensely and the kids have been involved as much as they could. Still working on keeping my two teenage girls active which has its challenges at times but they are coming around. My ten year old son loves hanging out and exercising with me though. 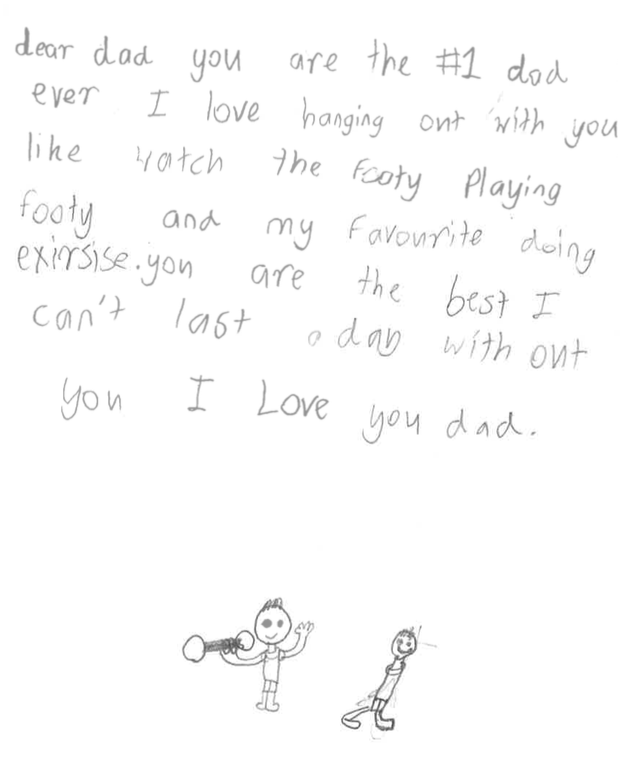 His birthday card to me which I have attached pretty much sums up what being a dad is all about, he actually thinks I am pretty cool and in some pretty cool “Dad” way I think I have inspired him too. So thanks for your awesome program mate, you have certainly helped shape a better future for me and my family, your program is easy to follow and done in a really candid way that most blokes can certainly relate to, can’t wait to rip into the Iron Dad program now. 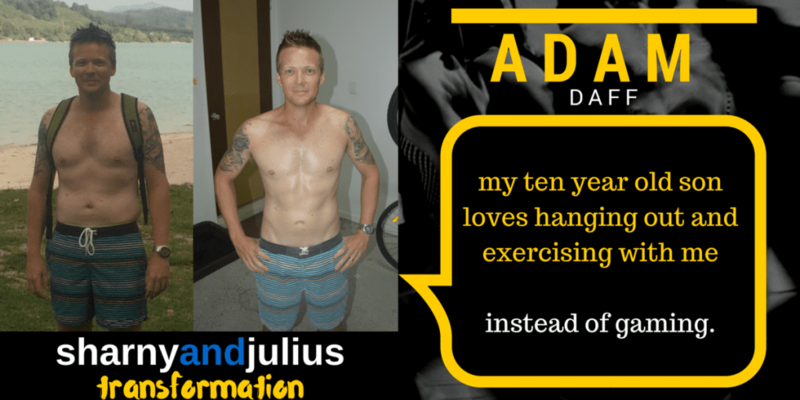 Started at 72.9 kgs and 18% body fat and finished at 65.5 kgs and 9.5 % body fat.